This feature movie based on the popular children's cartoon "Ben 10" which once again reunite the cast of this animated series to save the world and perhaps the universe yet again. When the nefarious Dr. Animo plans to de-evolutionise the world, Gwen and her grandfather are caught amidst his plans. Fortunately, Ben Tennyson with his alien technology, the Omnitrix (it basically allows Ben to transform into one of many aliens) comes to the rescue and just when Ben stops Dr. Animo from de-evolutionising the world, he is caught in the blast wave that makes that Omnitrix malfunction. 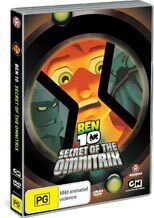 Now Ben, Gwen and their grandfather must find the creator of the Omnitrix only known as Azmuth that gives them four days to solve this mystery before all is lost. Traversing the universe, they visit strange and alien planets with giant robots that is a classic Ben story that focuses more on the characters rather than the power of the Omnitrix and will be loved by all fans of the series. Needless to say, it does help if you have watched the series before! BEN 10: THE SECRET OF THE OMNITRIX has THREE ALTERNATIVE FIGHT SCENES, not seen on TV, but available on the DVD! DVD includes an interactive quiz, to determine "which alien are you!"